Updated 11/19/03: Since I wrote the article below several years ago, the first signs of the predicted Gulf War Syndrome II have emerged in British troops, many of whom were given vaccines outside of safety guidelines. Now various investigators are looking into links between American soldiers' deaths and vaccines. Insight Magazine, which broke the story of vaccine experimentation and the first Gulf War Syndrome (see below) has begun to look into the story. Evidence of vaccine improprieties led a US federal judge to demand that the government stop giving experimental anthrax vaccines to its troops. (This ruling was quickly overturned.) My original (and since realized) warning that a second Gulf War Syndrome would emerge from US vaccination policy is reproduced below. Meanwhile the British press has reported that the first Gulf War Syndrome in British troops was likely caused by government experimentation using vaccines. But readers of my first book, subtitled, The Common Thread of Government Experimentation in the Acquired Immunodeficiency and Gulf War Syndromes already knew that. The US press, partner-in-crime with the corporate-controlled US government, continues to ignore the explosive story, even though the American government has been shamed into admitting, after twenty years of vociferous denials, that dangerous and unapproved experimental additives were indeed present in the vaccines given to unsuspecting US troops. "Our government has kept us in a perpetual state of fear--kept us in a continuous stampede of patriotic fervor--with the cry of grave national emergency. Always there has been some terrible evil at home or some monstrous foreign power that was going to gobble us up if we did not blindly rally behind it ..."
As threats of anthrax and smallpox allegedly spread by terrorists are used to justify government vaccine programs against these diseases, the author of AIDS: The “Perfect” Disease urges extreme caution in accepting government measures for fighting these diseases—arguing that smallpox and anthrax vaccines have previously been used to intentionally inject the public and military with experimental viruses and chemicals which have resulted in deadly diseases such as the Acquired Immunodeficiency Syndrome and Gulf War Syndrome. The author, Jerry Leonard, reveals that this was done as part of the hidden agenda in vaccinating the public—using existing vaccination programs to conduct unethical research for future vaccines—among other things. If this sounds incredible... consider that the truth is often stranger than fiction (especially when concerning the long history of government experimentation on US citizens) and the following recent revelations regarding the so-called bioterrorist attacks on the United States. "The dry powder used in the anthrax attacks is virtually indistinguishable in critical technical respects from that produced by the United States military before it shut down its biowarfare program, according to federal scientists and a report prepared for a military contractor." And what of this biowarfare program? It wasn't supposed to be making weapons at all--except of course for defensive purposes. But how do you know how to defend against something unless you understand its offensive potential? And how do you know a biological warfare agent's offensive potential unless you create it and test it? So much for objectivity and accountability. What’s going on here? Who are the real terrorists? The story is getting old and predictable... years of government lies are exposed only to find the government has been systematically doing exactly what it's not supposed to be doing. For decades the government secretly experimented on it citizens with radiation. For decades the government secretly experimented on its citizens with chemical warfare agents and mind control drugs. And continuing in the tradition of using US soldiers as guinea pigs, during the Gulf War, the government experimented on hundreds of thousands of its troops with vaccines and chemical warfare treatments--according to numerous medical studies--resulting in the Gulf War Syndrome. Now, finally, the public is catching on to the magnitude of the crimes being committed in the name of defense. Curiously, not only is the post-9-11 "antiterrorist" climate perfectly suited for government experimentation under the cover of protection, the vaccines to be used in this climate are the most perfectly suited for use in such experimentation. For example, vaccinia-based vaccines against smallpox, the virus which the government has touted as the most likely to be used by terrorist states, are ideal for researchers to use as experimental vehicles in vaccine research. Given the history of the government's experimentation on its citizens and its most recent manifestation in the Gulf War Syndrome, it also seems logical to ask what the rush is to push unproven and dangerous vaccines on the American public. Are we being set up for another Gulf War Syndrome disaster? Is the government's secret testing program on unwitting citizens indeed still active? Is this testing program being implemented through vaccines to pathogens that the government invents? Fortunately, the latest government offers of experimental anthrax vaccines, unethically tested on its own unwitting soldiers, have been largely declined by the public. This may prevent another Gulf War debacle from occurring. Unfortunately, Gulf War Vets who were forcibly experimented on with these vaccines were not so lucky—many have come down with diseases such as Lou Gehrig's Disease, which have been linked to experimental treatments given to them for their Gulf War service. (Many of these soldiers got diseases initially blamed on battle stress—even though they were never deployed to the Gulf.) Once the news of the experimental vaccines and their status as guinea pigs reached US soldiers, hundreds belatedly refused to take the vaccines—some even opted for severe punishment rather than take the vaccines. But curiously, BioPort, the sole manufacturer of the vaccines, which has been cited numerous times by the FDA, seems immune to punishment and lawsuits, even though it has continued to ship "questionable" vaccines to a captive populace in the military. Indeed, BioPort continues to get favorable treatment despite its horrendous safety record. Numerous researchers are speculating that top-level officials (some are former executives of pharmaceuticals corporations) are lobbying the FDA for special treatment of BioPort because its purported owners have connections to high-level politicians working for a powerful international arms firm called the Carlyle Group. And conveniently, these are some of the same politicians that not only helped create Saddam Hussein and Bin Laden in the 1980s but are reportedly business partners of the Bin Laden family in these activities. In addition to exposing and reviewing the unethical government research with vaccines which led to the Gulf War Syndrome, the author reveals the links between unethical cancer vaccine research and the outbreak of AIDS itself. A series of incredibly dangerous human experiments in which monkey cancer viruses were used to induce sarcoma tumors in humans is proposed as the prototype for that used to unleash the AIDS/sarcoma inducing virus—which is itself a type of virus developed for cancer research and tested for decades prior to AIDS as a means of inducing cancer for vaccine research. In addition to revealing shocking human experiments with monkey cancer and tumor viruses, the fabulous benefits of AIDS to both the cancer research establishment and the national security establishment are exposed in this work. Anyone considering taking the government's vaccines should consider the recent revelations regarding the source of Anthrax used in US bioterrorist attacks as well as the past history of the US government's massive testing programs on its unsuspecting citizens. Hopefully, this will prevent the past from becoming prologue. The Perfect Assassin: Did CIA mind control research lead to the JFK assassination? Reveals how Lee Harvey Oswald fits the profile of a “programmed” assassin as described in startling CIA documents written prior to the crime. Specifically, the author proposes that Gulf War Syndrome was caused by experimental vaccines given to troops who were unwittingly used in covert AIDS vaccine research and that AIDS was itself caused in a similar manner by researchers using vaccine programs to covertly conduct human cancer vaccine research. The many fascinating benefits of the AIDS epidemic to cancer vaccine research are described in this shocking study, as are published, pre-AIDS, human cancer experiments in which tumors were deliberately induced in human subjects by injecting them with monkey cancer viruses. WILLIAM J. BROAD, “The Spores: Terror Anthrax Linked to Type Made by U.S.,” New York Times, December 3, 2001. WILLIAM J. BROAD and JUDITH MILLER, “U.S. Recently Produced Anthrax in a Highly Lethal Powder Form,” New York Times, December 13, 2001. "A covert American program during the Reagan administration provided Iraq with critical battle planning assistance at a time when American intelligence agencies knew that Iraqi commanders would employ chemical weapons in waging the decisive battles of the Iran-Iraq war, according to senior military officers with direct knowledge of the program." "Iraq's use of gas in that conflict is repeatedly cited by President Bush ... as justification for 'regime change' in Iraq." "Though senior officials of the Reagan administration publicly condemned Iraq's employment of mustard gas, sarin, VX and other poisonous agents, the American military officers said President Reagan, Vice President George Bush and senior national security aides never withdrew their support for the highly classified program in which more than 60 officers of the Defense Intelligence Agency were secretly providing detailed information on Iranian deployments, tactical planning for battles, plans for airstrikes and bomb-damage assessments for Iraq." "As President George W. Bush and his war cabinet ponder Saddam’s successor’s regime, they would do well to contemplate how and why the last three presidents allowed the Butcher of Baghdad to stay in power so long." PATRICK E. TYLER, “Officers Say U.S. Aided Iraq in War Despite Use of Gas,” New York Times, 08/17/02; James Risen, “How a Plot Convulsed Iran in ’53 (and in ’79),” New York Times, 4/16/00; Christopher Dickey and Evan Thomas, "How Saddam Happened: America helped make a monster," Newsweek, 9/23/02. Associated Press, “Report Ties Expert to Supplier of Germs to Iraq,” New York Times, 11/28/96. These medical studies are summarized in AIDS: The “Perfect” Disease. "...five laboratories so far have been found to have spores with perfect genetic matches to those in the Senate letters, the scientists said. And all those labs can trace back their samples to a single U.S. military source." Rick Weiss and Susan Schmidt, "Capitol Hill Anthrax Matches Army's Stocks : 5 Labs Can Trace Spores to Ft. Detrick," Washington Post, 12/16/01. Ted Gup, "The Coldest Warrior," Washington Post , 12/16/01. "A Newsnight investigation raised the possibility that there was a secret CIA project to investigate methods of sending anthrax through the mail which went madly out of control. The shocking assertion is that a key member of the covert operation may have removed, refined and eventually posted weapons-grade anthrax which killed five people." Paul Rodriguez announced in Insight Magazine: "A synthetic substance -- an experimental adjuvant banned for use in humans ­ has been found in the trial blood tests of Persian Gulf War veterans. The federal government says it can't be so, but what if it is?" 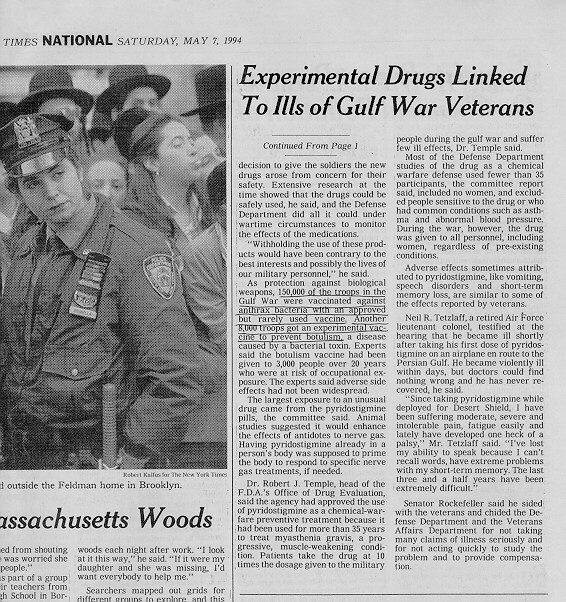 In a later Insight article titled "Gulf War Mystery and HIV", Rodriguez linked a synthetic form of the chemical squalene to the Gulf War Syndrome and revealed that the experimental substance found in sick Gulf War soldiers was used in experimental government vaccines that weren't supposed to exist: "The Pentagon -- though continuing to deny it used such an experimental medicine during the war -- now admits to using it in human experimental programs involving an anti-HIV vaccination." "Insight at first was told squalene was not in the government's arsenal of drugs -- then discovered it had been used in experimental medical trials at the National Institutes of Health involving cutting-edge herpes vaccines. Suddenly the story line was that, yes, it's used there -- but nowhere else. Insight discovered that it was used at the Army's Walter Reed Medical Research Center -- then the story line was that, yes, it's used there -- but only recently and only for an experimental malaria-vaccination program. When Insight discovered it has been used at Walter Reed for HIV research, the cover story moved to yes -- but only in laboratory work involving animals. Insight next discovered that Walter Reed actually manufactures a pharmaceutical-grade version of squalene. ....Finally we learn that the Pentagon -- by and through Walter Reed, among others -- has been engaged in human testing programs involving an anti-HIV vaccine using squalene as the adjuvant in concert with private firms through a cooperative program funded by the Pentagon." Paul Rodriguez, "Sickness and Secrecy," Insight Magazine, August 25, 1997; Paul Rodriguez, "Gulf War Mystery and HIV," Insight Magazine, Nov 3, 1997. "... public health officials knew the vaccine would be a tough sell because of diminished public confidence in the CDC. The agency made several initial assurances concerning anthrax that later proved wrong: It said that spores couldn't infect people from inside an envelope. It also said that blood tests would help pinpoint who was exposed. Moreover, the federal government has a history of conducting human trials on unknowing participants, including radiation tests on people in the 1950s and the Tuskegee Syphilis Study on black men from 1932 to 1972 in Macon County, Ala. The purpose of the Tuskegee study, which was supervised by the CDC, was to see how the syphilis germ destroys the body. ...Now, some people have doubts about what motivated the government's anthrax vaccine study. 'With the Cipro we felt like lab rats,' said J.D. Robinson, a reporter for AMI's tabloid The Globe, who chose not to take the vaccine or any more antibiotics. 'They don't even know all the side effects of this vaccine.'" Sanjay Bhatt, "The anthrax vaccine: Government's shot in the dark," Palm Beach Post, 12/30/01. When Insight first reported the preliminary lab results showing these antibodies, the DOD dismissed the findings. Because the department never used squalene in any medication or vaccine given to gulf-war soldiers, let alone experimented with the substance, officials contended, the DOD would be foolish to conduct an independent analysis. . . . . Now the General Accounting Office, or GAO, after its own six-month probe into Insight's reports... sternly has criticized the DOD for obfuscating on the issue. Indeed, the GAO discovered that the DOD long has known about squalene as a possible adjuvant drug and that the military has been experimenting with squalene-based medicines for more than 10 years, even conducting trials in Thailand involving squalene as an adjuvant for an anti-AIDS drug. [T]he GAO not only confirmed the extensive military testing using squalene-based adjuvants, it also revealed for the first time that DOD officials considered but allegedly then decided against using just such a vaccine -- supposedly to protect U.S. troops from potential Iraqi biological or chemical attacks. Congressional investigators tell Insight that they found these GAO conclusions profoundly shocking. . . . . Although the GAO and the DOD have not revealed what immunizations were under consideration for use with squalene as an adjuvant, military and congressional sources say they believe these must have been antianthrax drugs. ...The GAO said that while determining what the DOD may have done to cause 100,000 cases of gulf-war illness has been difficult, the GAO did uncover squalene-linked human testing protocols going back to 1988 when 500 subjects were administered an antimalaria vaccine. In 1990, another 12 human subjects were given a similar concoction and then another 121 in 1994. Between February 1995 and September 1997, at least 341 people received experimental anti-AIDS vaccines in Thailand involving squalene as an adjuvant at the same time that 93 people were administered placebos. . . . . But, the stonewalling continues. The DOD still claims that, despite changing story lines about its experiments with squalene-based drugs, it never used squalene on gulf-war soldiers, so there is no need to test. Paul M. Rodriguez, "GAO Calls for Squalene Tests," Insight Magazine, 26 April, 1999.